Once again we have been made aware of an illegitimate organization trying to coerce unsuspecting Monroe citizens into donating money under the auspices of Monroe’s volunteer firefighters. A group that calls itself the Volunteer Firefighters Association a program of the Heroes United PAC has been calling and writing people in Monroe asking for donations to help our firefighters. THIS IS NOT FROM ANY VOLUNTEER FIRE COMPANY IN THE TOWN OF MONROE. The Stepney Volunteer Fire Department does not solicit for donations over the phone. The Stepney Volunteer Fire Company, the Monroe Volunteer Fire Department and the Stevenson Volunteer Fire Company do hold annual fund drives each year that will ask for a donation addressed exactly to the respective fire department in your district, and will have a local mailing address. 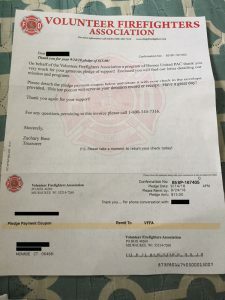 The Volunteer Firefighters Association is actually a political action committee based in Milwaukee, WI and has nothing to do with local firefighters. THIS ORGANIZATION IS IN NO WAY AFFILIATED OR ASSOCIATED WITH ANY OF THE THREE VOLUNTEER FIRE DEPARTMENTS IN THE TOWN OF MONROE, NOR DO WE BENEFIT FROM ANY DONATIONS MADE TO THEM!